I have a problem with intermittent Wi-Fi disconnections happening multiples per day and at random times. It would be great to get some feedback from experts on what the problem could be. I should say that when it started (a while ago), a Spectrum tech came by and looked at the connection with some sort of tester. He did this test a few times but said that he did not see any problems. Changing the router did not solve the issue. Using only one channel (5GHz and disabling the 2.4 GHz) has improved the situation except for Apple computers. I still get disconnections on other devices (including iPad) but less than before. Does not seem to make any sense to me. Some help would be greatly appreciated. Location: New York, NY 10026. Multi-family complex (2 units). Service: Extreme Internet – Ultimate 200 Upgrade (also Starter TV but I don’’t use it – coax is solely connected to the modem). Modem is online based on Spectrum website. Wired speeds: DOWN=215.1 ; UP = 17.8. Coax cable comes out of the wall. This is the only connection in the house. No other information. you may want to consider changing your channel number to either 1,6 or 11. Those are the most common,perhaps your next door neighbor has wifi on the same channels,that could cause interfernce and disconnections. also do you use 2 different ssid network names for your 2.4 and 5hx bands or a single one? A single one would allow your devices to choose which band to connect to......this may or may not help. since you said you have had the sames problems with different routers perhaps you should consider a wifi mesh system, instead of a simple single router. 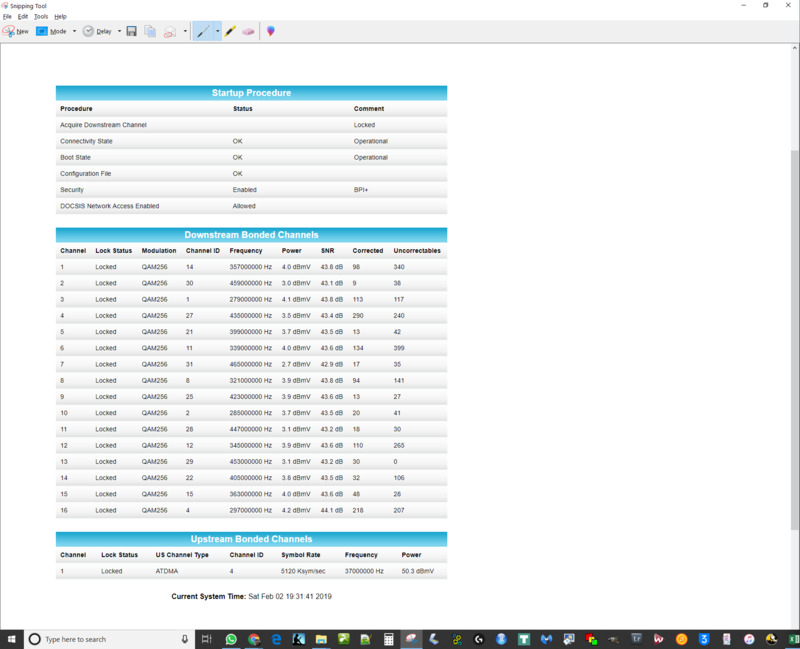 My router is at the back of the house and its signal strength would degrade by 25 dbvm from the front to the back.....with the mesh wifi system I have now, my signals are strong thruout the house with no disconnects. It seems the location of your router may be contributing to your problems? I once had disconnection problems with the same devices I have now,and once replacing the modem/router, the disconnections stopped. Maybe it's just me but I can't see the screenshot very well...it's way too small. If you have wired clients, and they do not exhibit disconnection issues, then the problem is WiFi. If your wired clients also lose connections, then the issue could be DHCP lease times. Set the longest lease time as possible. Perform a scan using a WiFi Client that provides channel numbers. See what your neighbors are using. Even though channels 1, 6, and 11 offer the most separation, they are the ones which are most used. If you live in the City, I am sure you'll see lots and lots of neighbors using these channels. If this is the case, have your router use a channel number that isn't used by anyone else in range and be as far away from an existing used channel. For example, if your client shows that 1, 2, 6, 10, and 11 are being used, I'd recommend setting up your wireless router to use 4 or 8. I can see that you only have one upstream channel. 99% of the footprint should have 4 upstream channels. Thank you for your reply and thanks also to the other persons who replied. Based on your advice, I have used a wifi analyzer and then switched the channel of my 5GHz network from a low one (Can't remember which one, 42?) to a high one (#155). This was simple and fixed my problem. There must have been some specific interference because the 5GHz band is not too crowded where I am. I get a -70dBm signal. I have also reactivated my 2Ghz band and also changed the channel (a lott more crowded) to channel 4, where I get a -60dBm. I'm not sure I understand what "99% of the footprint" means but if I only have one upstream channel instead of 4, what are the consequences and how can I solve this? Most all areas served by Spectrum have 4 upstream channels. There are a few pockets where that may not be the case and perhaps you are in one of those areas. The consequences of having only one channel available is increased risk of instabilty in the connection. If that one channel experiences problems the entire connection suffers instead of the others taking up some of the slack.